Forty years ago, Intel co-founder Gordon Moore predicted that the number of transistors in an integrated circuit would double approximately every two years – a prediction that proved astonishingly accurate. Optical communications has progressed at a much slower pace. Historically electronic components have become about 70 per cent faster each year, while in contrast the capacity of optical transmission systems and their optical interfaces has only increased by about 20 per cent annually. At 100G, optical transmission hit a roadblock that forced the industry to move in a new direction. And in doing so, the fortunes of the optical industry have become more tightly tied to the progress of silicon-based electronics than they ever were before. Delivering 100G performance required equipment vendors to overcome the physical limitations faced by conventional WDM transmission technologies, such as low tolerance to chromatic dispersion. Matthias Berger, senior director, optical hardware, at Nokia in Nuremberg, Germany, compares this challenge to an ice cube left outside the freezer. Like the ice cube melting, a bit travelling through the fibre spreads out over time. After long enough – a few hundred kilometres in the case of the bit – nothing recognisable is left. Besides chromatic dispersion, 100G signals suffered from other impairments, such as lower polarisation mode dispersion tolerance, and intensified nonlinear fibre effects. The answer was coherent optical transmission, which encodes data using both the phase and amplitude of the signal. Standard photodetectors can only measure the intensity of light; therefore, to extract the information at a coherent receiver requires powerful digital signal processing (DSP). Even as expensive first- and second-generation DSP technologies progressively prove themselves in practice, communications service providers are now looking at next-generation capabilities to prepare for the future. The improvements that they can make are in large part enabled by moving to the next process node in silicon technology. However, in 2016 the news for those whose future relies on silicon processors could be considered worrying. Silicon processing power has followed the exponential curve of Moore’s law since the 1970s – but in February Intel announced that it is slowing that pace. As circuits get smaller, scientists and engineers are beginning to see difficulties, such as heat dissipation and current leakage, which affect the ability of electronic circuits to advance at the same rate. Below 10nm transistors near the atomic scale, beyond which it seems impossible to get any smaller. This clearly influences the future for DSPs – but it’s just one of many hurdles technology providers know they must overcome to keep pace with galloping data demand. On the client side, in internet companies’ hardware racks, 100G coherent networking technology can exploit the pluggable CFP specification family of modules that integrate DSP devices within their packages. Intended to plug into switches or routers – connecting them into WDM systems – such modules are available from various vendors, who can exploit DSP devices from specialist digital electronic companies. Announcements at the Optical Fibre Communications conference in Anaheim, California, in March 2016, showed what the immediate future holds for these DSP devices. For example, the ExaSPEED 200 DSP announced by Japan’s NTT Electronics can serve 100G QPSK long-haul and 200G 16QAM metro optical links. It is available to start sampling early in the second quarter of 2016 with a production release in the second half of 2016. Similarly, the third-generation CL20010 LightSpeed-II from Irvine, California’s ClariPhy, is a 200G coherent single-chip transceiver with a DSP engine. ClariPhy is partnered in a CFP2 analogue coherent optics (ACO) ‘ecosystem’ with module producers including fellow Californian companies Finisar and Oclaro, and Fujitsu Optical Components, headquartered in Kanagawa, Japan. This will place greater demands on silicon technology, as higher baud rates and higher order modulation will incur more distortions, which will need to be compensated by the DSP. ClariPhy is already working on some of the most advanced processors in optical networking to satisfy the needs of CFP2-ACO modules. The company demonstrated a 16nm FinFET coherent platform at OFC with a chip manufactured towards the end of 2015. 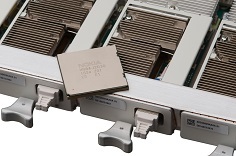 Yet there are other challenges that DSPs bring beyond the chips themselves, Swenson admits, some notably arising from the interface between DSPs and modules. Channel-to-channel skew in the phase difference between pulses on different transmit and receive lanes can vary from one module to another, he notes. It is important that the DSP chips tolerate or compensate for this skew, the executive says – and LightSpeed-II does. ‘These issues are relatively minor compared to the optical signal compensation that the DSP deals with,’ Swenson added. Similar versatility is also enabled by PSE-2’s seven modulation formats, including 8QAM, with which Nokia has pushed 400G services into long-haul applications for the first time. ‘Before PSE2, 400G applications were mainly possible in metro-type applications, around 600-800km, and now we can push beyond 1,500–2,000km,’ Berger underlined. ‘We also have two flavours of 16QAM, one supporting 400G, and another uniquely supporting 500G. PSE-2 also has implemented single carrier 400G, based on 64QAM, the most complicated modulation format in the industry right now in an available product.’ Set-partitioning quadrature phase shift keying (SPQPSK) has been added to specifically address very long haul terrestrial and submarine transmission, he adds. Sunnyvale, California, headquartered Infinera has also exploited an in-house developed coherent DSP in its multi-terabit ‘Infinite Capacity Engine’ optoelectronic subsystem. This builds on the first generation 40nm DSP Infinera has been shipping for four years alongside the photonic integrated circuits (PICs) in its existing flagship platform. As well as doubling the number of channels, Infinera has added capabilities like ‘in-flight integrated encryption’ to the new DSPs that Mahajan said ‘a lot of our customers have been asking for’. Other bonus features include compensating for non-linear effects whose unpredictable impact on signals is otherwise hard to fix. ‘Our advanced coherent techniques help mitigate those non-linear penalties using soft-decision forward error correction (SD-FEC) and gain sharing,’ he said. SD-FEC gain sharing, as far as he knows, is unique to Infinera, although ‘we would expect others to follow at some point’. Mahajan explains the concept of gain sharing thus: ‘Two DSP channels can be in different parts of the fibre core. One channel could be traversing a good part and the other a bad part. The weak part may not have enough strength to pass over the commissioning limit. That would mean you’re not able to use that part of the spectrum and hence there’s a loss of capacity and reach. Gain sharing combines the strength of the strong and weak channel. Their error codes are combined, and therefore now exceed the commissioning limit. This is only possible if we have a two-channel DSP. Like Swenson, Mahajan emphasised that the end of Moore’s law has been heralded several times. He refers to coverage in The Economist suggesting that it could continue for another decade. ‘As we get down to the atomic level, below 7nm, we’ll be paying very close attention to alternate approaches, including quantum computing,’ he said.